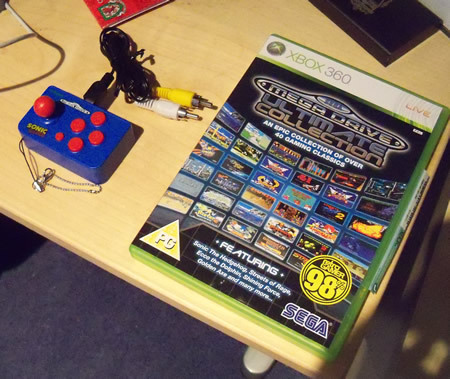 I was recently sent to review the “Worlds Smallest Megadrive” – Arcade Nano Mini Megadrive Review, a small joystick with a keyring attached. They come in three flavours – the Sonic version, the Columns version & the Beat Em Up version. Each version has 10 games on it – this revie focusses on the Sonic Version, which comes with 5 Mega Drive Games: Sonic 1, Sonic 2, Sonic 3D, Sonic Spinball & Alex Kidd. There’s also 5 bonus games on there: Air Hockey, Naval Power, Cannon, Fight or Lose & Checker. Say what you like about the bonus games (and I will a little later), but it’s amazing they fit 5 Megadrive games into something this size. Unfortunately, with the thing being so small, it can be a bit fiddly. You need a precision screwdriver (something I didn’t have when reviewing it!) to get the back off the joystick to put the joystick. Furthermore, the USB to video controller doesn’t appear to work through a SCART socket, so you’ll have to put it through a standard AV setup, something I’ve had to find. Furthermore, this wire could be a little longer. I had to review it standing up in my front lounge! It’s fine for Wii Fit, but not for Sonic. You’re presented with a menu when you load up the console, where you can select one of the 10 games. The games themselves play as you imagine from the megadrive games, and the little joystick does work remarkably well, as do the buttons. It’s not quite megadrive pad quality, but Sega’s Sonic works remarkably well. 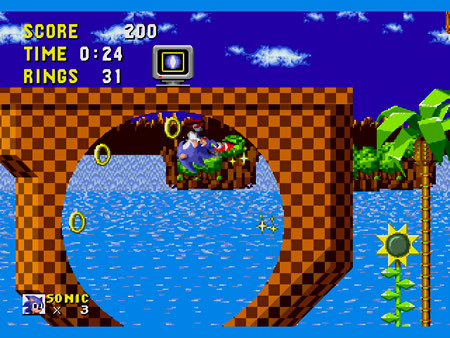 Sonic Spinball & Sonic 3D are a bit fiddly at times – though to be fair the latter was always fiddly. On the other hand 5 bonus games are forgettable, but are fun distractions for 5 minutes. Sonic is one of the games, and plays really well. So what’s it like to play? Well they’re fun, if not specacular. Sure the games work well, and are great for passing times in boring hotels or caravans. It’ll never replace the Megadrive, but it’s well worth hunting out for retro gamers for their birthday or Christmas. If you are, I’d recommend the Sonic one, as the quality of the actual games is a lot better on the Sonic version (you have 2 bonefide classics, Sonic Spinball, and 2 other above average games). They retail from £10.99 and you can buy the arcade nano mini megadrive from The Games Basement.